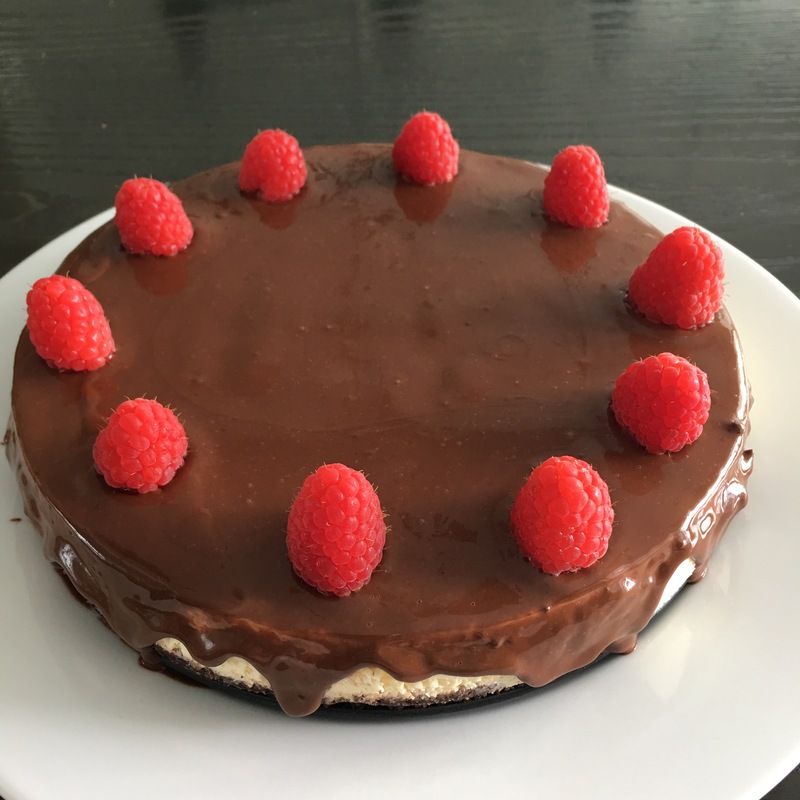 Ok…drum roll…my first Instant Pot cheesecake! I’ve always been really skeptical about pressure cooking cheesecake – I think I make a pretty mean NY cheesecake in the oven with a water bath, but I think I’ve been seeing too many posts of people making cheesecake in the Instant Pot. I could quite get to do this for a while because I had ordered the Instant Pot silicone rings online because my existing ring had a good beefy, chickeny smell to it and that would not have gone well as a flavour overtone in cheesecake. I haven’t baked in a while; I have been really busy with work and ministry and it was refreshing to be able to get hands on with this recipe. Most people know that I tend to bake when I’m stressed out; somehow the process of working with my hands and creating a new recipe energizes me. And it helps that both hubs and kid#2 hugged me for the after dinner treat tonight! So at the recent Intentional Disciplemaking Conference (IDMC2016) recently, Ps Edmund Chan spoke about the keys to finishing well in the marketplace. I was particularly struck by his explanation of what working to “optimum” versus working to “maximum” was. Working to maximum pretty much describes my work patterns for the past 20 over years of my life. I’ve noticed that in the past few years God has introduced periods of enforced rest into my life (broken ankle, various surgeries!). Working to maximum puts one at risk for burn out. Working optimally on the other hand requires one to do one’s best but wisely in the constraints of life. Therefore one can be rested when working from a place of rest. Since baking relaxes and recharges me, I figured that this would be a good way to ensure that I work “optimally”. So this weekend I released my pressure by pressure-cooking cheesecake 😁. There are plenty of great recipes out there but I did this with low carb adaptations. I was tempted by pictures of Oreo cheesecakes so the base is reminiscent of a chocolate biscuit crust. The filling itself is chocolate-free as I think a chocolate base, filling and topping would have been way too much. Kid#2 who is a chocolate monster may not agree though. This was a rather small cake as I was only making it for the family, but the filling recipe can be doubled to give a taller cheesecake. I think the best part about pressure cooking the cake is that it is neat, makes minimum mess and takes 1/2 the time to make compared with regular cheesecake. I so love the Instant Pot – I think I’ve joined the ranks of potheads 😂. Take out the eggs and cream cheese from the fridge to room temperature. Prepare the springform pan by using a large piece of aluminum foil to cover the base and sides of the pan. Melt 50g butter in the microwave oven. Mix in the almond flour, cocoa powder and sweetener. Evenly press the almond flour mixture in the base of the springform pan with a tart tamper or the back of a spoon. Beat the cream cheese with a mixer, then add in the sugar substitute, lemon juice, lemon zest and vanilla essence and continue beating. Beat in the eggs, one at a time. The mixture should not be over beaten at this step. Pour the filling into the prepared springform pan. Place a trivet into the Instant Pot and add 1 1/2 cups of water. Make a large aluminum foil sling with a width of about 3-4 inches and lower the pan into the Instant Pot. Close the Instant Pot and set the valve into the sealed position. Pressure cook on high for 40 minutes, then turn off the pot. Allow natural pressure release for 10 minutes, then do a manual release. Remove the pan from the pot, using the aluminum foil sling to lift it up. Allow the cheesecake to cool down. Add the chocolate and the cream into a bowl and microwave for about 1 minute. Add the sugar substitute and stir well till the ganache is smooth and silky. Run a thin spatula around the circumference of the cake. Remove the rim of the springform pan. Pour the ganache over the cake carefully, moving the cake from side to side and tilting it slightly to get the drippy effect of the ganache spilling over the side of the cake. Top the cake with several raspberries. Chill overnight till ready to eat. typo in step 2.. almond foil haha. I made this yesterday and served it today. I left off the top chocolate layer because I felt like I didn’t need it. This was so good! I loved the dark chocolate crust. I will make this again. Thank you for sharing. Thanks so much Bonnie! Glad you liked it! 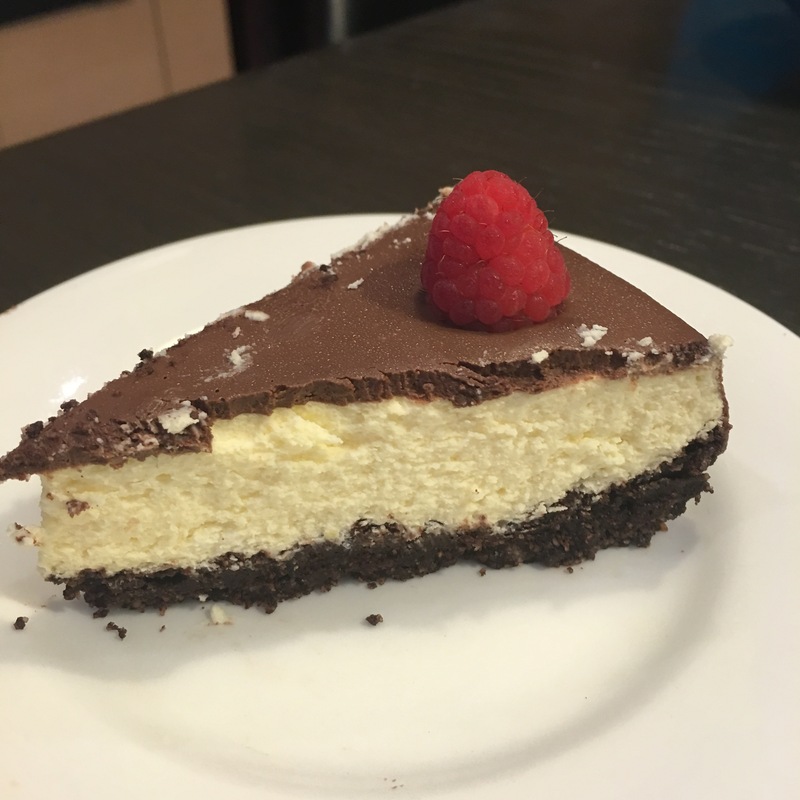 I’ve made a few IP cheesecakes, including triple chocolate for this Christmas. It looked like it came from a pro bakery, a true showstopper, thanks to the IP. They are the BEST way to make cheesecakes; they come out firm with a flawless ice skating rink top! I hadn’t seen this post, but I did a similar crust to yours and modified several recipes for the filling, adding some of my own ideas, and my ganache topping was very similar to yours. It was not too much chocolate, in fact I’m going to make the crust even more chocolately next time!!! Chef Tong, if you haven’t tried using the 7″ or smaller Fat Daddio removable bottom pans for these, they rock! I got the 3″ deep ones because I like to make tall cakes and cheesecakes (I have both 6 & 7″). You’ll never want to use springform again! My IP baking methodology is almost the same as yours, except that I use only 1 cup of water in the bottom and I bake for only 25 min on the highest pressure for a firm cake (15-20 produces creamier). One of my favorite subs with most recipes is to use 2/3 natural cream cheese and 1/3 chèvre — it’s amazing, especially with either a chocolate, lemon or lime cheesecake! I also add a little sour cream and use duck eggs! These are great ideas! I like your suggestion to make taller cheesecakes – I must try that soon! Yes, and for the filling base I usually do 16 oz cream cheese (I use Gina Marie’s natural) and 7-8 oz log of chèvre (I use Laura Chenel) with 3 eggs (duck) and ~ 1/4 c sour cream. Depending on the filling flavor that I’m going for, I use honey and/or grade B maple syrup. (Everything else in the filling after that is for flavor.) This make for a nice tall cheesecake in the 7″ pan. Whatever’s leftover, I fill into ramekins for a 2nd round in the IP, but less time. ps Pumpkin pie custard, and any type of custard, is also awesome in the IP. I can fit 7-8 ramekins (stacked 3 deep) at one time for pumpkin cutie pies. So good and fast!!! If I wanted a larger cake and doubled the recipe, do you think an 8″ push pan would work? I think it would. I’ve doubled the recipe before to get a taller cake. But what size pan did you use for the recipe? And does the foil go on the inside or the outside? I used a 7 inch springform pan. The foil goes on the outside. I don’t have an instant pot, can this be done in another cooking option? I.e. Crock pot, a regular pressure cooker on stove top, or oven? I would do it traditionally in the oven with the springform pan placed within another baking tray half filled with water. Bake time about 60 minutes at 180 deg C.